Picornaviruses are important human pathogens. They infect a number of different tissues and cause a variety of diseases. The most notable human pathogens are the polio, coxsackie and echo viruses which have been implicated in insulin-dependent diabetes, myocarditis, hepatitis, orchitis, meningitis and encephalitis (Curnen, 1979; Freeman, 1985; Ginsberg and Dulbecco, 1980; Huber and MacPherson, 1984). Picornaviruses are ubiquitous and most of us develop antibodies to a number of the members of this group (Lerner et al, 1975). Usually, the viruses induce either asymptomatic or mild febrile illnesses, but they also produce life-threatening diseases in a small number of infected individuals (Freeman, 1979). Various factors influence the severity of the infection and the degree of tissue involvement including the age and genetic constitution of the individual, the concentration and variant of the virus and the physiological state of the host (Craighead, 1981; Cudworth and Wolf, 1983; Naji et al., 1983; Woodruff, 1980). Animal models are useful in identifying host genetic factors controlling viral pathogenicity. The M variant of encephalomyocarditis (EMC) virus infects the pancreas, heart and brain of mice and causes diabetes, myocarditis and paralysis. As shown in this report, tissue damage results from T cell mediated autoimmunity rather than from virus mediated injury. 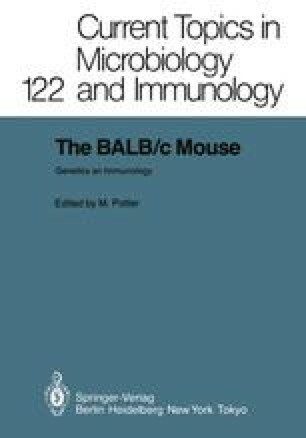 Additionally, Balb/cCUM and Balb/cBYJ mice differ strikingly in susceptibility to these autoimmune diseases.